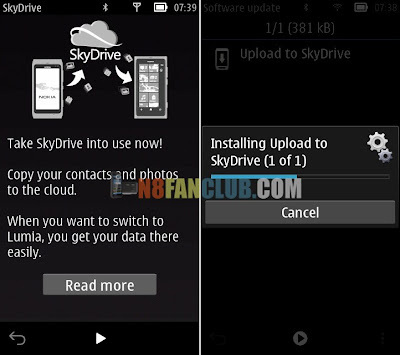 A minor optional software update “Upload To SkyDrive” is available for Nokia Belle devices. This update enables automatic photo upload to Microsoft’s online cloud storage service SkyDrive.“Upload and store your photos right when you take them with the all-new Upload to SkyDrive app. SkyDrive is your personal online storage space, accessible from anywhere- all you need is your Windows Live ID. If you don’t have one yet, go to www.live.com . Upload to SkyDrive uses Wi-Fi to save on data costs, but you can use your data connection as well” Please restart your device after the update installation.